Obituary for Diane (Miller) Ervin | Wellman Funeral Homes, Inc.
Diane Jean (Miller) Ervin, age 66, passed away peacefully Wednesday, September 12th, at her home surrounded by her husband, Lawrence E. Ervin, and daughters, Krista (Ervin) Thompson and Jennifer (Ervin) Ott after a courageous battle with cancer. She was born February 1, 1952 to Donald T. Miller, Sr. and Betty (Coleman) Miller in Circleville, Ohio. 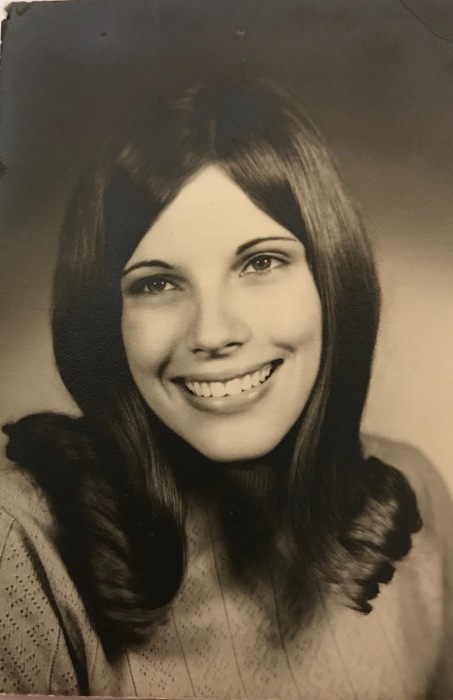 She graduated from Circleville High School in 1970 and then Ohio State School of Cosmetology. Diane then married her high school sweetheart, Lawrence E. Ervin and recently celebrated their 47th Wedding Anniversary. Working as a beautician in Circleville for 47 years, she was passionate about her career, co-workers, and her customers and took great joy in caring for others. She spent many years as a 4-H advisor in Pickaway County. Along with her love for being a hairdresser, she enjoyed gardening, crafts, scrapbooking, card-making, camping, mushroom hunting, metal detecting with her husband, family dinners, watching her grandchildren's activities, Christmas, the Pumpkin Show, and traveling to the beach. She received Jesus as her Savior at 14 years of age and was baptized at 16 years old. She is a member of Heritage Nazarene Church in Circleville. Beyond her career and hobbies, she enjoyed her family. She was especially devoted to her grandchildren and great-grandchildren, always planning special activities, giving extra attention and demonstrating to each of them that they were loved and special. Her smile, her laugh, her loving, friendly attitude will be greatly missed by many. She is survived by her loving husband, Lawrence E. Ervin, daughters Krista (Brian) Thompson, Jenny (Ben) Ott and her mother, Betty M. Miller. Grandchildren Brooke (Jesse) Dawson, Zoe Frye, Katie Thompson, and Samson Ott. Step-grandchildren Makayla Arnold and Tristen Arnold-Posey. Great-grandchildren Ryleigh, Kennedy, and Charlotte Grace Dawson. Brothers Ted (Cindy) Miller, Dave (Kathy) Miller, brother and sister-in-law Lew (Bernie) McCann and nieces Kim, Stephanie, Sara and Ruby. She will also be missed by her traveling friend, Mary Kay Thompson. She was preceded in death by father, Donald T. Miller, Sr. and in-laws, Edward and Rosemarie Ervin. A celebration of Diane's life and spirit will be held at Wellman Funeral Home, 1455 N. Court St, Circleville, Ohio on Monday, September 17th from 5-7 p.m. with service at 7 p.m. In lieu of flowers, the family requests charitable donation in memory of Diane Ervin to the American Cancer Society or Pickaway Township Fire Department.